Shade $0D is unfortunately significantly darker than 0 IRE. The NES was designed for NTSC-J , so there was no design for different black and blanking levels. This wiki page contains the measurements I did some years ago: color $0D is approximately -12IRE. With full color emphasis on, shades $01-$0C average to approximately 4 IRE. Even with -12 IRE, I'd still rather have that (and a light grey on the right bar) for some limited functionality, rather than zero functionally with everything the exact same color. Also the grid on the linearity screen (pressing A) is BY FAR the best and most useful test pattern, (I believe it's 7x7 black pixel squares with 1 pixel thick lines, which are very good parameters) could be EVEN BETTER if pressing A again could cycle to remove the 5 circles, as these circles often get in the way, much like an OSM does when trying to scrutinize a white line for calibration. Last edited by SpiderWaffle on Thu Feb 01, 2018 4:14 pm, edited 1 time in total. 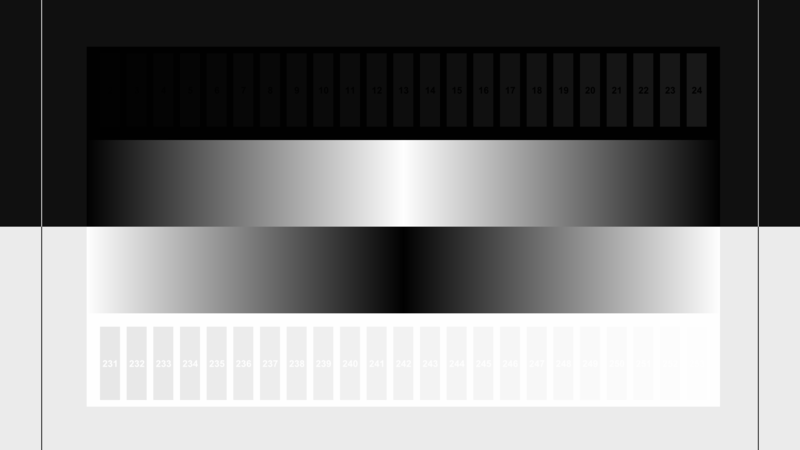 "The game uses a non-standard "blacker than black" color value for black pixels and then further exacerbates the problem by using "emphasis bits" to darken the whole screen. This pushes things even further out of spec so that the TV sees a sync pulse where there shouldn't be one." Well if that's the case no, but I assume that was with composite, and maybe RF only. I'd be interested in using it for RGBS which would have the sync line separated and couldn't happen. Further, I wonder how much the emphasis bits play a part in that vs -12 IRE instead of the 0 which every CRT is more than designed to handle. Regardless, a light grey on the right bar would be better. If you're using RGBS from a NESRGB, HDNES, or 2C03, it's already completely synthetic and only vaguely related to the composite generated by the 2C02... I doubt any of those devices emit something useful for shade $0D. The "SMTPE color bars" test does and "IRE" test can already display shade $0D. "The "SMTPE color bars" test does and "IRE" test can already display shade $0D"
That is, in fact, exactly what I am saying. From what I recall, the small deep-black region in this ROM's test is not nearly as problematic as with The Immortal. Sometimes how much of it there is onscreen can matter a lot. E.g. my capture card wobbles with The Immortal but didn't seem to be bothered with this test. Loss of picture is theoretically possible, but it really varies from hardware to hardware quite a bit. lidnariq, that's neat they're in there, (though the IRE pattern is somewhat dubious because also has much lower values); unfortunately, it doesn't seem to work at all like others have said, at least with RGBS and S-video through the RGBNES, could it maybe somewhat work through composite/RF unmodded? The solid color screen is also awesome for checking purity. Those two are about the only patterns I use 240p test suite for. And I guess with higher end consoles, the SMTPE pattern can actually be accurate enough auto-calibrate BVMs and the like. The sound check, system clock checks, lag test and some others are pretty neat too. Thank you for the feature requests. So something like this I take it, where hot pink represents the $0D. How would that test be translated for the RGB consoles (TG16, Genesis, and Super NES)? Mostly I try to track the functionality of the Super NES test, and I might include a corresponding screen in the NES version. I'll pass on your request to the topic on Shmups Forum to see if they can come up with a corresponding test. [The Linearity test] could be EVEN BETTER if pressing A again could cycle to remove the 5 circles, as these circles often get in the way, much like an OSM does when trying to scrutinize a white line for calibration, particularly convergence. As I get time, I'll let Shmups Forum know about the limits of Grid and Linearity when setting convergence to see if there's demand for a fine grid test as you describe. "So something like this I take it, where hot pink represents the $0D." Yes, that pattern for the NES would be nice! Since it doesn't have very much in terms of greys, really dark greys, the darkest other colors work better, like the dark brown. Further, half being on white background with lightest colors (maybe the light grey here is good) could be good too, see example link below. *NOTE the continuous gradient stuff in the middle not necessary or especially helpful or applicable for limited color palettes. "How would that test be translated for the RGB consoles (TG16, Genesis, and Super NES)?" Last edited by SpiderWaffle on Wed Feb 21, 2018 3:15 pm, edited 2 times in total. "As I get time, I'll let Shmups Forum know about the limits of Grid and Linearity when setting convergence to see if there's demand for a fine grid test as you describe." The main thing is really just getting that same fine grid patterns, but with the circles removed. For more capable consoles, getting the white lines as thin as possible is always helpful. The Parameters are great, 29-30 squares high. Would you be happy with a black screen transition between the circles-and-grid screen and the grid-only screen? Or do you require the ability to enable and disable the circles instantly the way the current ROM enables and disables the grid instantly? You mean like a few frames of black before the just the fine grid comes up? that wouldn't really be a problem, faster is always better, but a few frames isn't much.